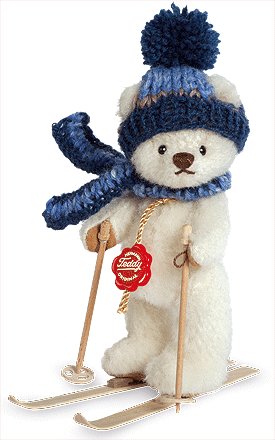 Teddy Hermann miniature Teddy Skier Bear. Fully jointed and made of the finest white Mohair. Llimited edition of only 200. Product details: Item number 117100, safety eyes, synthetic filling material, non growler, Surface washable only, size 15cm tall.